The Baltimore Orioles have generated more than $360 million in cumulative economic impacts in Sarasota County since 2015, which was the first year Sarasota County staff analyzed comprehensive data for such a report, the team has announced. 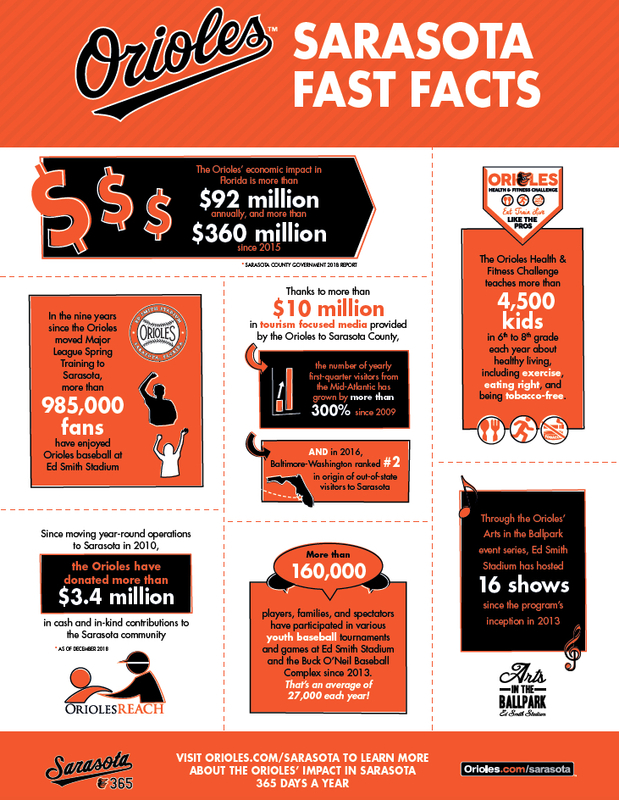 “The county’s analysis measures the total tourism impact created by the Orioles, combined with the club’s business operations and spending in Sarasota County,” a news release explains. At $92 million for the most recent reporting period, the Orioles’ annual impact is nearly three times the figure projected when the Orioles moved Major League Spring Training operations to Sarasota County in 2010, the release adds. “The entire Orioles organization takes pride in providing the greatest economic impact to the Sarasota community of any sports organization in history,” said John Angelos, executive vice president of the team, in the release. “We remain steadfast in our commitment to producing year-round Major and Minor League Baseball games, world-class arts and cultural events, and year-round youth training and family recreational programming in the Sarasota community,” Angelos added in the release. “The economic impact delivered to Sarasota County taxpayers and residents results from the club’s marketing and promotion of Sarasota tourism to its fan base across seven Mid-Atlantic states, combined with the commercial activity and corporate presence of the Orioles’ athletic training headquarters, production of public sporting and other entertainment events, and management of youth sports tournaments and recreational programs,” the release points out. The Orioles’ results have been bolstered by record attendance at Spring Training games, the release notes. This season, the Orioles will celebrate the “One Millionth Fan” to attend Orioles games in Sarasota since 2010 — the fastest pace to reach that milestone of any franchise in Sarasota County’s nearly century-long history of Major League Spring Training, the release says. Through tourism-focused media and promotional programs pioneered by the Orioles to support Visit Sarasota, the number of yearly first-quarter visitors from the Mid-Atlantic region has grown by more than 300% since 2009, the release points out. “In the first quarter of 2015, the Orioles were credited by Sarasota travel authorities for making history in yet another way, when the club’s Sarasota 365 campaign catapulted the Orioles’ Mid-Atlantic region to become the number one source of Sarasota tourism,” the release notes. In 2017, the Baltimore-Washington market generated the second-highest number of out-of-state visitors to Sarasota County, surpassed by only the New York City market, the release adds. 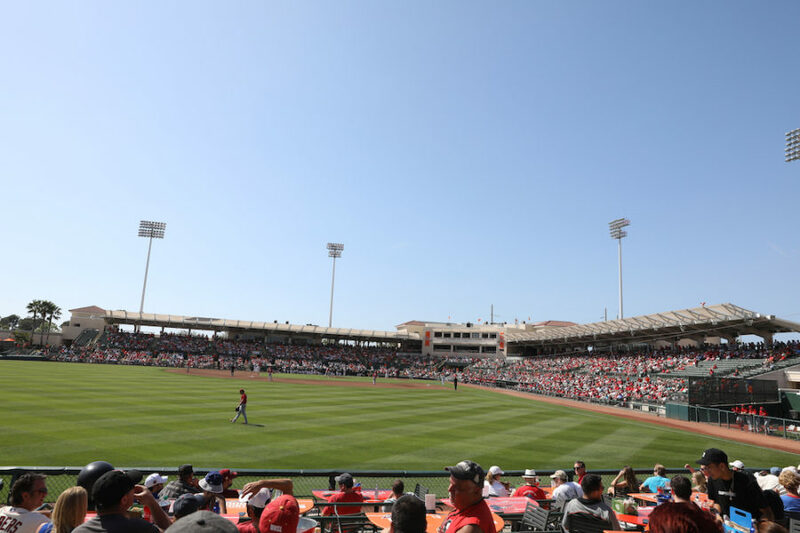 Since the Orioles moved Major League Spring Training operations to Sarasota in 2010, more than 985,000 fans have enjoyed Orioles Spring Training games at Ed Smith Stadium, the release says. Additionally, each year more than 27,000 participants and spectators visit the Orioles complex to participate in youth tournaments, baseball clinics, sports leagues and other family-friendly and charitable events, “which are professionally managed, supported, and frequently financially subsidized by the Orioles,” the release explains. For more information on the Orioles’ year-round activities at Ed Smith Stadium and the Buck O’Neil Baseball Complex at Twin Lakes Park in Sarasota, visit Orioles.com/Sarasota.